The Anglo-Japanese style house that occupies Beverly Road at the corner of Brevoort Street is the lone survivor of three such houses that stood at that intersection. Barely visible to its right in the 1938 photograph is a second such house which was torn down back in the 1960's. Directly across the street (off camera to the right) was the Fleischmann mansion. All three homes were owned by a florist named Joseph Fleischmann. The 1938 photograph was taken only weeks before the Fleischmann mansion was to be torn down to make way for the Beverly House Apartments. The sign to the right suggests that the new apartment building was originally going to be called the Beverly Gardens. 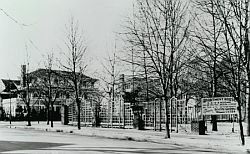 Notice the brick stancions that surround the mansion in the 1938 photograph. Although the mansion is long since gone, it has left behind three mementos in the form of brick stanchions which still remain on three of the four corners of the Beverly House property. One stanchion can be seen directly behind the middle car in the 2004 photograph. Editor's Note: Kew Gardens is on a roll. Today's New York Times carries an article about Kew Gardens' own Bliss Cafe (located in the same store that used to house The Interlude). You can read the story on the Times web site by clicking the link below. The link will open in a new window. Close out the window to return here. The Times web site requires a subscription. If you do not have one, use the following member ID and password to enter. 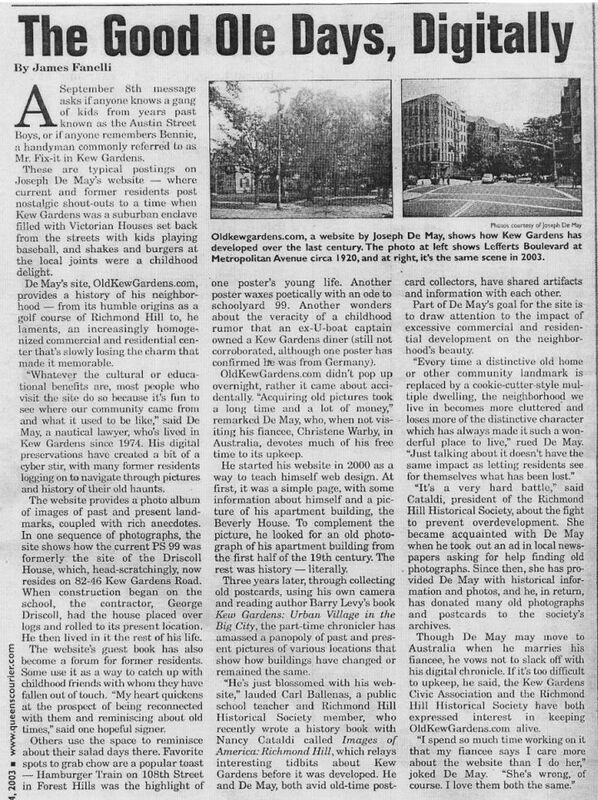 Editor's Note: The Real Estate section of yesterday's New York Post newspaper had an article about Kew Gardens which you can read online by clicking the link below. The link will open in a new window. Close out the window to return here. Would love to hear from any old friends who went to PS99,Sage, or RHHS. Just to let you know the next poetry-music "extravaganza" at the Bliss Cafe, 86-20 Austin Street by the Long Island Rail Road Station, will take place on Friday evening, Feb. 4th, between 7:30 and 10:00 P.M. If anyone wishes to perform, they're welcome. They can contact me and I'll definitely be in touch with them. Hope you can make it. Just got an email from John Carlson telling me that Steve Suskind was killed in a car accident in California yesterday.(Sunday). Steve was one of the Roomates who made music in the 60s and was on Bandstand in 61. We will all miss him but have wonderful memories of him. Anyone wanting to contact John, his email is doowopjack@earthlink.net. Went to PS 89, Russell Sage and Richmond Hill High School. We lived on 83rd Avenue in the old Ehler (coffee and spices) house and my mother lived there until 2000. I still drive though and marvel at how lucky I was to grow up in such a safe and beautiful neighborhood. I would welcome hearing from any of my old friends and acquaintances. During my tenure in Kew Gardens I was a denizen of the Austin Book Shop. I had the honor of changing the diapers of Barbara and Michael Titowsky. Bernie Titowsky would pay me in the best currency in the world: books, many of which I still own. The cafe by the LIRR station was a coffe house during the late 1950s. The proprietors were named Floy, Eden, and Don; their last names remain in the fog of what has become my memory. Would like to get in touch with anyone who went to forest Hills high School in the late forties. I've read every letter and have found friends I have not seen since graduation. I was born over Mr. Bees 5 & 10. We later moved to the Shellball. My grandfather Edgar Wolferman, father and Karl Lehman owned Bauer's Meat Market. So many great stories to tell. Presently I am trying to organize a 50th birthday party for P.S 99 class of 1967. So far I've connected with about 15 people and looking for more. "At the same time, many communities are ... battling unwanted over-development. 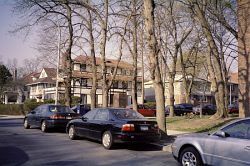 Building on what we learned from the Staten Island Overdevelopment Task Force, we're working with homeowners and homebuilders to prevent inappropriate development, and preserve the traditional character of Throgs Neck, Bay Ridge, Kew Gardens, and other neighborhoods." Your website is interesting. My family and I love living in Kew Gardens Hills. It is pleasant and suburban here. All of Flushing is very interesting, with people of many different nationalities. The Kitty Genovese article was informative. I heard about it on the news when I was 8 or 9 years old. At the time, I lived in the suburbs of Westchester, and I had no idea that Kitty was killed in Kew Gardens Hills. Thank you for very informative website. I plan to vitit it regularly. Editor's Note: One of the featured pictures for this month was billed as the "Toilet Bowl" - a topographical depression at Queens Boulevard and the Grand Central where Kew Gardens kids used to sled in winter time. The photograph from which the scan was taken is labeled "Kew Gardens 1974" and I was sure it showed the Toilet Bowl. I have now been told in no uncertain terms by people who used to play there that the photograph is most certainly not the Toilet Bowl and may well have been taken in Forest Hills, not Kew Gardens. (Now I know how Dan Rather felt!) So, I have removed that photograph and substituted different image on another topic. My apologies to all. Editor's Note: Click here to read a short piece about Kew Gardens taken from the 1928 publication entitled, Long Island : The Sunrise Homeland presented here in edited form.. I have grown up and lived in Kew Gardens my whole entire life and now my children have too. They have enjoyed the same playground, schools, parks, and pizza parlors I did as a child and I have no regrets for never leaving. It remains an oasis of greenery, only a few stops from Manhattan. I always take a deep breath when I get off the train at Union Turnpike station and take the quick walk down the cool, green back streets to get home. There is nowhere else like it. There are so many fond memories and great people that grew up in kew gardens. I just thought I would make myself available for a bit of reminesing. The "Toilet Bowl" - Not? Editor's Note: One of the new images featured this month shows some children sledding down a slope. The scan comes from a photograph labeled "Kew Gardens 1974" and I figured it was a shot of the "Toilet Bowl" - a topographical depression at Untion Turnpike and Grand Central where kids from Kew Gardens used to play. Well, at least one Kew Gardens alumnus who should know better than I says the photograph was actually taken in Forest Hills and is not the Toilet Bowl at all. Is he right and do I need to deep six this particular image? Let me know. I grew up on Talbot Street. From 1950 through the early 1970s, my father, Karl Lehmann (currently 97 years old and quite well), was a co-owner (along with Eddie Wolfermann and Harry Hess)of Bauer's Meat Market (on the Leffert's Blvd. bridge over the LIRR). My mother, Lisa, who passed away, in 1978, worked in Curt L. Sterner Co., Inc. (an import/export company, located first on Babbage Street and then on Metropolitan Avenue). I graduated from RHHS in 1962 and then received a BS in Biology from SUNY-Stony Brook (1966) and a Ph.D. from Princeton in 1969. Following postdoctoral training at Brandeis and Oxford, I have been at Boston University School of Medicine since 1973 and am currently Prof. of Physiology and Biophyics and do research on the molecular mechanism of regulation of muscle contraction. I'm married to the assistant to the President of BU and have two kids, one a junior at Brown and the other a junior at Needham High School. I'm still (and will always be) an avid Yankees' fan, and suffered the worst days of my life (when nothing truely went wrong) living amongst the rabid Sox fans this past fall. Visit Bill's Boston University Medical Campus Web Page. I googled myself and found someone had responded to my inquiry. I remembered Johnny's almost as soon as I had posed the question to your readers. That was a nice response from that person. He/she brought up the proprietors of Parklane Pharmacy. I remember them well. Stoic, good looking pharmacists - you could really put your faith on them. They filled many a perscription for our family. One day, I went into the pharmacy with my girlfriend, Mary Jo. We were third graders unescorted - just what a pharmacist needed. Their store with all its cosmetics and goodies had a huge pull for us. There we were, roaming the aisles - she on one side, I on the other when CRASH - I knocked over a whole display. The pharmacist asked us "who is responsible for this?". Mary Jo said "not I". I said "not I" and I ran out of the store totally humiliated. Third graders had the run of the neighborhood, rightly or wrongly. Today, not even my fourteen year old goes out unescorted!! Also, over the holidays, I went with my sister to the old hood. Awesome experience!! I walked in front of 8316 Brevoort and found the initials I had carved into the cement 34 years ago (slightly covered by patch but still there). What happened to all the Chestnut trees, mighty as they were? Is someone restoring the pagoda house north of Metropolitan Avenue? Many houses have gone but that was true when the family finally moved from Kew Gardens in 1977. There was one beautiful home a block south of Forest Park - about 84th avenue and 119th Street no longer there. It was near the little mustard colored stucco nursery school which also served as a polling place.